Sub. 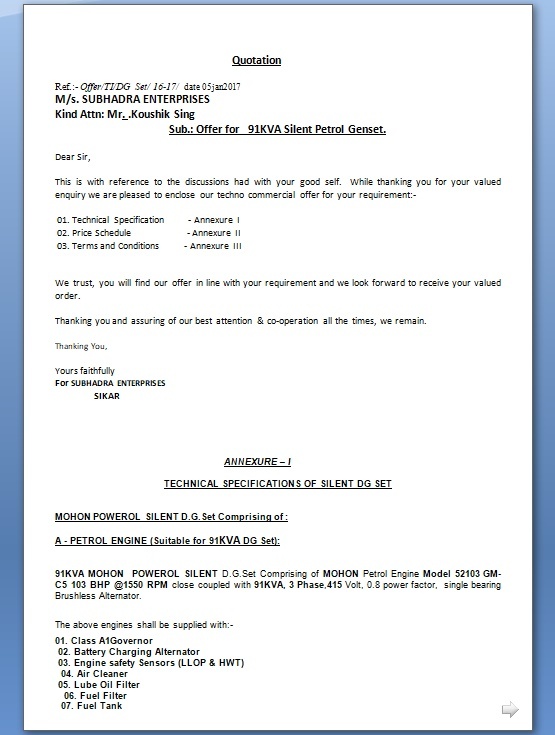 : Offer for 91KVA Silent Petrol Genset. We trust, you will find our offer in line with your requirement and we look forward to receive your valued order. Thanking you and assuring of our best attention & co-operation all the times, we remain. 91KVA MOHON POWEROL SILENT D.G.Set Comprising of MOHON Petrol Engine Model 52103 GM-C5 103 BHP @1550 RPM close coupled with 91KVA, 3 Phase,415 Volt, 0.8 power factor, single bearing Brush-less Alternator. Crompton Greaves Make / (or anyother equivalent make )developing 91 KVAat1550 RPM at 0.8 lagging power factor at 415Volts suitable for 50 Hz, 3phase system. The alternator shall confirm to IS: 4722/BS: 2613 and will be suitable for tropical condition. Silent DG Set enclosure is of modular construction with the provision to assemble & dismantle easily as per site condition. There are no protruding parts. The Sheet metal components are pretreated before powder coating. The enclosure is fabricated out of CRCA sheet of 14/18 SWG. The fuel level is indicated with the help of fuel gauge meter. Battery is accommodated in a separate tray in the enclosure. The doors are gasketed with high quality EPDM gaskets to avoid leakage of sound. The door handles are lockable type. Sound Proofing of enclosure is done by PU Foam. A special residential silencer is provided with the enclosure to control exhaust noise. Specially designed attenuators are provided to control sound at air entry to the container and exist from the container. To make system vibration free, engine & alternator is mounted on specially designed anti-vibration pads. Adequate ventilation is provided to meet air requirement for combustion heat removal. Temperature of enclosure does not exceed beyond 5 to 7 degrees of ambient temperature. Fuel Tank: Daily service fuel of 16 hour’s run. Complete with air vent, inlet and outlet connections. 91 KVA MOHOM POWEROL SILENT D.G. Set Comprising of MOHON Petrol Engine Model 52103 GM-C5Developing 106BHP@1550 RPM close coupled with 91KVA, 3 Phase, 415Volt, 0.8 power factor, single bearing Brushless Alternator. Note- VAT (15%) will be extra taken on base price. EXCISE DUTY: Prices are Inclusive of Excise Duty @10.30%. Any statutory variation in duty & taxes at the time of actual despatch shall be to your account. VAT:Extra @ 2% against form “C”. (Form “C” & Road permit should be provided prior to despatch of DG Set) or VAT extra @14%. Octroi/ Entry Tax, if applicable shall be to your account. TERMS OF PAYMENT:30% payment as an advance along with order & balance 70% payment against Performa invoice prior to despatch from our factory. FREIGHT:Prices are Exclusive of freight charges . TRANSIT INSURANCE: Extra at actual to be paid by you. DELIVERY:Supply within 4 - 6 Weeks from the date of receipt of your order along with advance, subject to force majeure conditions and unforeseen delay, which is beyond our / our manufacturers’ control. WARRANTY:The offered Engine & Alternator is warranted for a period of 1.5 years from the date of despatch OR 5000 Hrs. of operation from the date of commissioning, whichever is earlier against any manufacturing defect/defective materials only. However, electrical and other proprietary items like battery would be covered as per their respective manufacturer’s standard warranty clause. The warranty will not cover the normal wear and tear or damages caused by accident, wrong handling and improper maintenance. VALIDITY:Our offer shall remain valid for a period of 1 Month from the date of our offer and subject to our confirmation thereafter. SCOPE OF SUPPLY: Our offer is confined to whatever is specifically included and stipulated in the technical and commercial clauses and is subject to changes as may be mutually agreed upon finalization of the contract. EXCLUSIONS: Our offer is for supply of equipment only. Installation job work, i.e., unloading of DG Set at site, earthing pits, G.I. strips, foundation, power cabling & control cabling with end terminations, exhaust piping with supports, manual changeover switch etc. shall be charged extra. ARBITRATION: In the event of any disputes or differences arising between the parties out of or relating to the validity, construction, meaning, operation or effect of this offer, or any amendments or other documents relating to this offer, or the breach of the terms of any document agreed to between the parties, the same shall be referred to Arbitration, as per the provisions of the Arbitration and Conciliation Act 1996 and the arbitration proceedings shall be held at respective jurisdiction area. It will be a pleasure serving you for your valued requirement. Looking forward to provide you our best of the services.